Our geomarketing solution provides answers to questions such as: Where can I find my target group and how can I reach them? What is the best location for my store? Our Marketing Packages combines smart data with easy to use mapping tools. This contributes to a better understanding of where a target group is located and where your product/service has the most potential. Reach the right target group at the touch of a button with our Marketing Package. From more than 60 countries we have mapped out demographics and disposable income down to neighourhood- and postal code level. By filtering by age and/or income you locatie your target group in an instance. You are also able plot to your own data on the map. Spotzi Premium is part of our Marketing Package. You have direct access to areas with the highest disposable income level. When combining these datasets with your own data (e.g. customers or store locations) you can immediately find new business opportunities. That is the power of a map. Branded Cities is one of the largest outdoor advertising agencies in North America. Together with Spotzi they created a dashboard that maps out all billboards for their customers. A dashboard that shows the type of customers that are living close to every billboard and help their customers to reach the right audience. In addition to demography and income, we have an extensive amount of data that helps you to get to know your target group even better. Our postal code boundaries help you plot your customers. 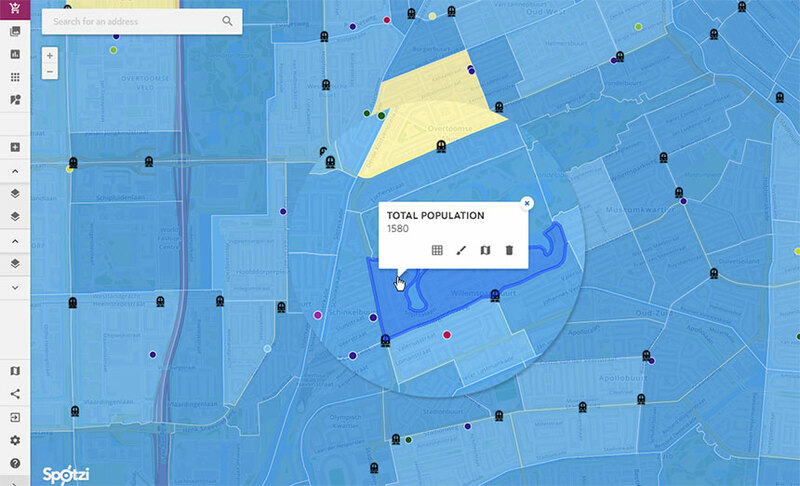 Instantly find new opportunities with our high-quality boundary data. We have detailed postal code maps of over 50 countries. The maps are updated on a regular basis by our professionals. We can also provide you with extra data at the postal code level such as income and age. Learn about your customers! Spotzi offers a broad range of data that provides insight into the purchasing behavior of potential customers. This insightful data reveals the purchasing power potential for 17 food- and non-food product lines in more than 60 countries of the world. It is available at postal code level. For some countries, this data is even available at census level. The Spotzi Consumer Styles give you a better understanding of your existing client base. Also, it can help you find new prospects in areas with similar consumer types and minimize wasted advertising efforts. Your brochures, samples and mailings will generate a better response if you focus them in areas with high concentrations of your target group. Alternatively, you can target customers by postal codes online on Facebook and Google. Join us and start mapping. 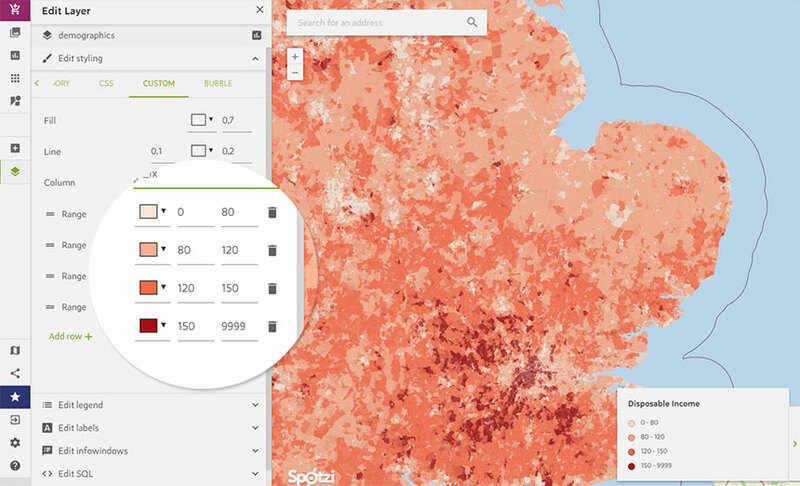 Your first map starts in our datashop with numerous free and premium datasets ready to import into your own dashboard. Want to add your own data? We have done our best to built an easy-to-use solution. Draw your real estate listings, map your trails, or upload an Excel spreadsheet. Personalize your map and add custom icons to your map. Add your own logo or create icons yourself to make your map unique. Share your maps with the world, your friends, a colleague or a client. Export the map as an image or share it as a link. Everyone can enjoy your map. You can easily embed your maps into your own website. With 100,000 mapviews a month you don’t have to worry about running out of views. We offer you a street map based on OpenStreetMap as a base map. Over 10,000 users worldwide make sure this data is accurate. All your data will be kept private. We create daily back-ups and monitor your import failures. We offer first-class tools and support. Don’t worry about storage limits. With a standard 5GB of storage, you can add as many datasets as you want.